Here at ONS we’ve got insight into our users from research and an understanding from web analytics about what’s hot on the website. But what we didn’t have, until now, was clarity on what kind of message drove the most traffic or time spent on site. Knowing this should allow us to optimise future messaging. In addition to copy formats, it’s assumed that images and interactives have a positive effect so the increase of infographics and data visualisations being produced here should help on that front. We use HootSuite to publish our social content and Webtrends on the web analytics side of things. The two can work together so each link we publish can be tagged with set parameters and values within each parameter. 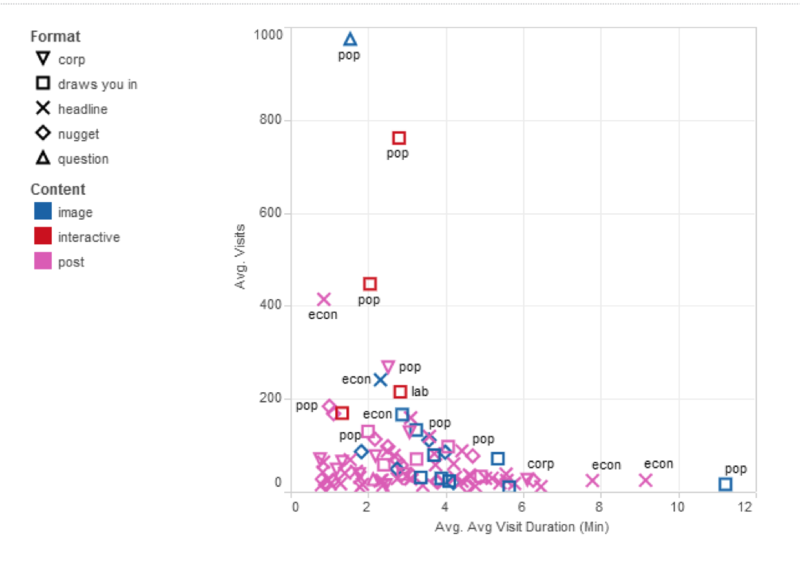 HootSuite also works with Google Analytics in the same way and like with ours, that data can be pulled from an API, which Rob in our Data Vis team put into this scatter graph on Tableau Public. This visualisation doesn’t represent engagement in our content off site. It’s a big ask to interrupt someone flicking through their social feed, to come to our site and spend time there. So shares and chatter around a subject could be high even if visits to or time spent on the website is nothing special. This visualisation doesn’t take in to account bounce rate. On from the point above, it’s a big ask to expect a user to consume content on our website when it doesn’t optimise for mobile which the lion share of visitors to our site from social are on. Because of point 2, we’re very careful to make sure the reason someone clicks on one of our links is answered or very clear when they land on the site. Sometimes the destination is deep within the site where various pages on the same subject are organised into sections with ‘#sectiontitle’ at the end of the URL. Like this. This Webtrends / HootSuite mash up doesn’t like them, so what you see in the tableau is a fraction of what could be there. This has been a useful exercise to back up the copy formats introduced back in February at the writing for social media @ONS sessions. I think we should continue for a month or so to get a little more data and try to address some of the caveats above. After then though, we should draw a line under it. As we’re not selling products, we don’t need to labour over every word for optimum response, splitting hairs to get a few more visitors from social when in the grand scheme of things search engine optimisation (SEO) will have much more impact on pushing numbers up. All said and done though, it’s important we continue to have a mix of content with or without images told through different copy formats, so as not to dilute messaging when it really needs pushing. We’ve spent the last few weeks conducting a survey to understand what people need and want from our website. The survey was incentivised with a free lunch at Guyer’s House(kindly donated by the hotel) but it seems the most responses came when we just asked for help. Anyhow, the data’s in and shows some interesting patterns. Notably that the content the survey respondents told us was most important doesn’t correlate with what Google Analytics shows had the most traffic. This suggests that there’s work to be done to help users find content which should be fixed with improved navigation and site layout, as well as writing with Google in mind as so much traffic come from it. To be sure, we’ll do some 1:1 interviews with some respondents who offered to help out with more research, the final piece – the comprehension part – of this puzzle. For now anyway. 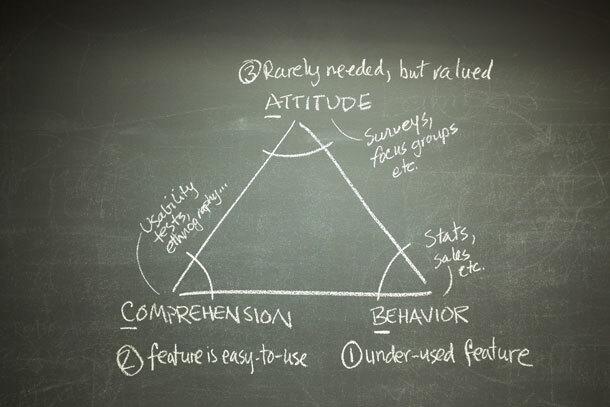 Triangle showing 3 points of user research: 1. Attitude (gleaned from user surveys), 2. Behaviour (gleaned from web stats) and 3, Comprehension (gleaned from interviews and the rest).